The newest book by Michael Connors, coming soon! At a time when more travelers are rediscovering Cuba, this book offers an in-depth exploration of 101 of the most authentic and compelling sites that reveal the real Cuba. Caribbean antique expert and art historian Michael Connors presents the breadth of this island’s most intriguing destinations and architectural treasures—from secluded mountain resorts and waterfalls to the many shady plazas and cultural centers. The book features iconic places like the tobacco plantations in Pinar del Rio, the fortresses and palacios, Hemingway’s home outside of Havana, Xanadu (the DuPont mansion), the old French Triolet pharmacy in Matanzas, and the Sugar Mill Valley in Trinidad, all shown with lush photography shot exclusively for this book, bringing each location and treasure alive. Whether you are planning a trip or dreaming of faraway places from the comfort of your living room, this volume is more than a guidebook; it is an insider’s guide to the heart and soul of exquisite, nostalgic, and always fascinating Cuba. 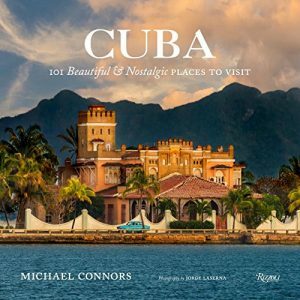 CUBA: 101 Beautiful & Nostalgic Places To Visit from Michael Connors on Vimeo.